​Is the atomic age an inevitable consequence of piecing together disparate information without moral restraint? ​Now that we have unleashed this horror upon the Earth, how has humanity responded? Below is an excerpt from a blog I wrote five years ago which I have minimally updated to reflect 2016. After the excerpt, is a continuation I wrote recently. Today, Russia and the U.S. still have nearly 2,000 nuclear weapons each primed for use at very short notice (this number has remained nearly identical for five years). Combined, the countries have approximately 4500 operational atomic bombs. ​My question is, ‘where do we go from here?’ Stronger weapons? Tsar Bomba already carried a potential yield of 100 megatons of TNT. Purposely restricted to only half of its potential, this 50 megaton thermonuclear bomb was already tested, and worked. This bomb, at half power, produced, in one explosion, 10 times the amount of total fire power used in WWII, including both Hiroshima and Nagasaki. This bomb exploded about 2.5 miles from the Earth’s surface and registered a 7.1 on the Richter scale. ​The seismic shock created was observable three times as it circumnavigated the globe. The fireball was 5 miles in diameter, the mushroom cloud was 40 miles high, all buildings in a village 34 miles away were completely destroyed, third degree burns occurred 62 miles away, windowpanes broke 560 miles away, the flash was seen 620 miles away, and the fallout at full scale could have accounted for 25% of all nuclear fallout since atomic bombs were invented. This is not a current event. This October 30 will be the 55 year anniversary of this detonation. ​Although Vonnegut Jr. is obviously being rhetorical in his suggestion that we simply make time run backwards, metaphorically, however, this is precisely our only sane option. ​So, I look back on the many Sci-Fi films of the past and try to see how they relate to both ‘their’ times and ‘my’ times. That is, how did this have meaning then and how does it have meaning now. The Sci-Fi and horror genres are inexplicably connected with the fears, with the ethos, of the period. In 1945, America unleashed two atom bombs on Japan. In the 1950’s the Japanese personified this tragedy and its fallout with Godzilla; American’s were warned of the consequences of nuclear war with The Day the Earth Stood Still. In the 60’s we had Dr. Strangelove or: How I Learned to Stop Worrying and Love the Bomb and a very dramatic (so much so that it was quickly banned from television) documentary from the BBC entitled The War Game (shown at the end of this excerpt) depicting what nuclear war would spell for the United Kingdom. In the 70’s, the sequel to the Planet of the Apes predicted a future where humanity worships the atomic bomb. ​Here we are today. How does atomic warfare fit into our ethos? Is it still a menace as Godzilla portrays? Are we keeping it within our realm, under control, as The Day the Earth Stood Still beseeches us? Or are our whims of diplomacy feeble and nuclear fallout only inevitable? Do we still worship the atomic bomb? These are important questions we need to ask ourselves. Below is the docudrama 'The War Game' (1965)- banned from television until 1985 - in two parts. Replica of Little Boy, shown with people for scale. Diagram of the inner workings of a nuclear (fission) bomb like Little Boy. ​On August 6, 1945 the United States of America (USA) ushered in the atomic age of warfare by dropping the first of two atomic bombs on the Japanese city of Hiroshima. Hiroshima was chosen as a target since it was a supply and logistics base for the Japanese military, and because "[t]here are adjacent hills which are likely to produce a focusing effect which would considerably increase the blast damage." The plane that was to carry the bomb was called the Enola Gay, manned by Colonel Paul W. Tibbets. Little Boy, the atomic bomb, was loaded with over 140 pounds (64kg) of uranium-235. At 8:09AM, Tibbets began his bomb run in the Enola Gay and handed over control of dropping Little Boy to his bombardier Major Thomas Ferebee. At 8:15AM Little Boy was dropped 31,000 feet above Hiroshima- the bomb fell for 44.4 seconds (the time it takes one television commercial to air during the Super Bowl) before ultimately detonating approximately 2,000 feet above the city. A silent 44.4 seconds separating the atomic age from the 4.5 billion years of evolution that preceded them. I imagine the tensions on the plane; white knuckled sweaty palms, weeks or contemplation, years of scientific development, failed diplomacy, and, behind the tears and second guesses, the ultimate consequence of what would become accepted by some as a ‘necessary evil’ and detested by others as war crimes and one of the most heinous acts in the history of mankind. ​By the end of 1945, the death toll from the bombing of Hiroshima had doubled to 140,000- a city with a once thriving population of over 350,000 had only 83,000 people left. Dust kicked up by the mushroom cloud over the city was carried into the sky by hot air where it became contaminated with radiation only to return in a rain storm as ‘black rain.’ The aftermath of the detonation was described by many as ‘Hell on Earth.’ In these conditions, malnutrition, starvation, and extreme thirst afflicted most of those still alive. As the black rain fell, many survivors, in desperation for hydration, consumed the contaminated water. Microcephaly affected the unborn fetuses of pregnant mothers within close proximity to the hypocenter and over the next decade, increasing cases of chronic illness including leukemia, lyphoma, myeloma, kidney, ovarian, urinary tract, breast, colon, lung, esophageal, and stomach cancers would take their toll on the Japanese population. ​The USA had called upon the Japanese for surrender on July 26, 1945 in the Postdam Declaration- warning that if they did not swiftly agree to the terms they would face “prompt and utter destruction.” The Japanese chose to ignore this request and responded only with silence (Mokusatsu). Nevertheless, the Japanese received no warning for the utilization of an atomic bomb and civilians were not given an opportunity to leave the area. Furthermore, Japanese civilians that were in any way perceived to be playing a role in the war effort (ie: day laborers in factories) were legally deemed combatants and thus considered legitimate targets (Edwards 1996, Warrell 1996). Using the bomb without warning was conducted intentionally- the USA believed that the only effective way to use a nuclear warhead against the Japanese was to unleash it without warning and thus achieve its greatest psychological and destructive significance (“Shock and Awe”). ​Despite pleas by many within the USA to merely show the Japanese the destructive power of the bomb and then ask them to reconsider their surrender, it was ultimately decided that thistactic would be ineffective (Frank 1999, Compton 1956). A major concern was that no nuclear bomb had been tested via deployment from a plane. The first successful test of a nuclear bomb had only occurred only three weeks earlier at the Trinity test site in the southwestern state of New Mexico (the site now houses a museum on nuclear weapons). This test, although successful, was a stationary device- the ethos was that if the USA wanted to display the power of the nuclear bomb to warn the Japanese of their impending doom and then it failed, there would be no chance of a Japanese surrender. ​So, how did it come to this? On December 7, 1941 the Japanese attacked the Hawaiianport of Pearl Harbor using353 Imperial fighter, bomber, and torpedo planes. The ultimate toll was 2,403 deaths, 1,178 injuries, 188 destroyed aircraft, all 8 US Navy battleships were damaged (four of them sank), and 8 other ships were destroyed. 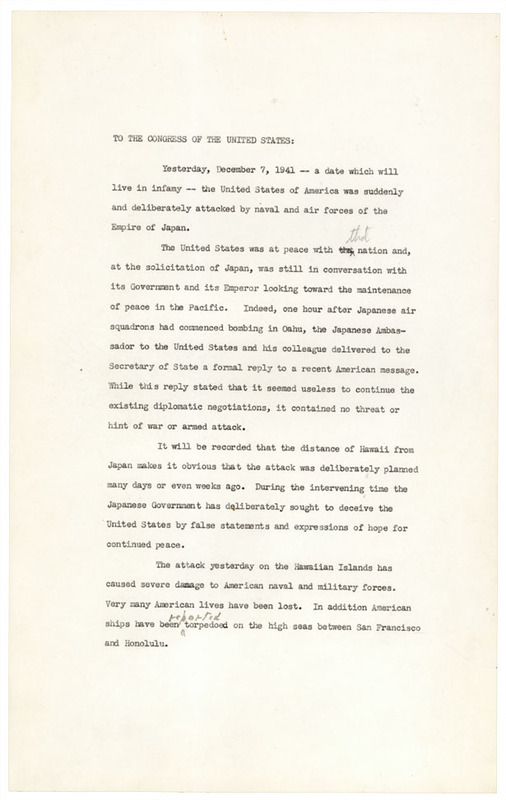 This attack occurred without warning and without a declaration of war on the USA from the Japanese and thus was deemed by Franklin Delano Roosevelt as “a day which will live in infamy.” The stance of the USA up to this point regarding entrance to WWII,much to the chagrin of Winston Churchill and the British, was isolationist in nature. It was after the bombing of Pearl Harbor that the zeitgeist within the USA shifted to that of an interventionist world view. The following day, the USA declared war on the Japanese, four days later, after a declaration of war from Germany and Italy, the USA was ushered into WWII. 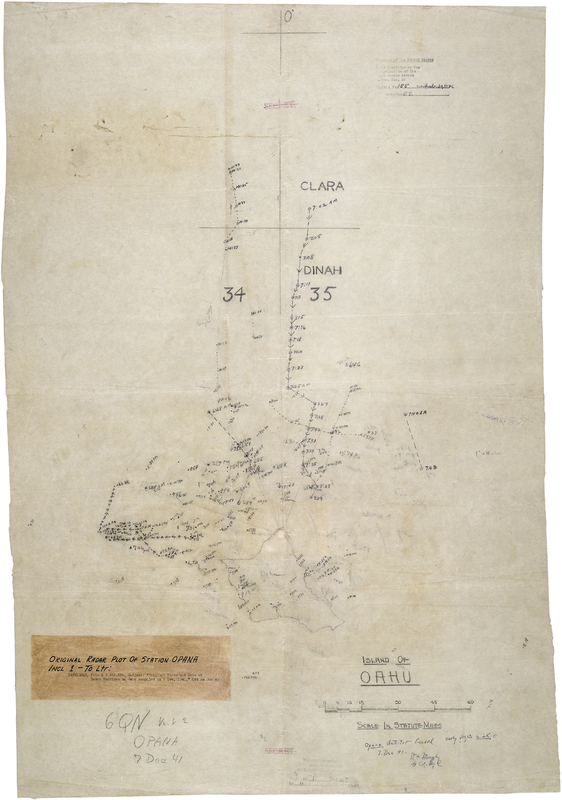 ​Within three months the USA issued Executive Order 9066 which called for the incarceration of deportation of over 110,000 Japanese Americans into incarceration camps. The propaganda machine reared its ugly head, quickly anyone with Japanese heritage within the USA was considered a potential threat and an enemy of the state, and by 1945 over 50% of Americans believed that "a majority [of the Japanese] are naturally cruel and brutal". Much like Nazis had done with those of Jewish heritage; the Japanese were swiftly dehumanized and caricatured, labelled Japs or other derogatory names, and often portrayed as an inferior race that was less than human. US citizens were meant to care little for the mistreatment of the Japanese given their inferior status- this sentiment is precisely encapsulated by the Bugs Bunny children’s cartoon entitled Nip the Nips which first aired on April 22, 1944 (and was later deemed so racist that it was banned from television). 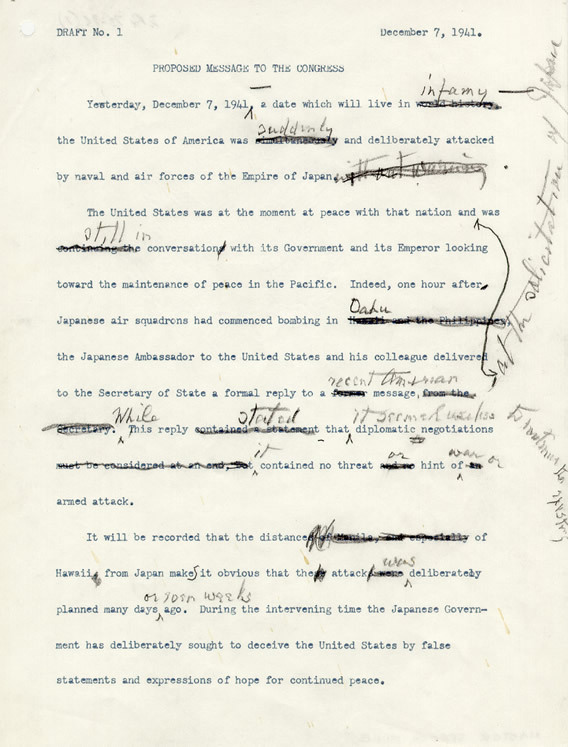 Much of the carnage and after math of the atomic bomb was censored from the American public. The result of this racist social indoctrination was that by late 1945, after the bombing of both Hiroshima and Nagasaki, approximately¼ of Americans wished that more bombs could have been dropped on the Japanese. ​Truman and Churchill would justify the bombings by claiming they saved over 1.5 million US and British lives in addition to millions more Japanese casualties by preventing Operation Downfall- the planned allied invasion of Japan. In Truman’s eyes, it was a blessing that the USA had spent $2 billion on the development of the bomb- “[the USA has taken the] greatest scientific gamble in history – and won.” Based on the advice of the Einstein-Szilard letter, written almost exactly six years prior to the bombing of Hiroshima by a Jewish physicist that had fled to America in 1932 to escape the Nazis, the USA had won the race to nuclear armament with the consequence of ushering in the atomic age. I understand Germany has actually stopped the sale of uranium from the Czechoslovakian mines which she has taken over. That she should have taken such early action might perhaps be understood on the ground that the son of the German Under-Secretary of State, von Weizsacker, is attached to the Kaiser-Wilhelm-Institut in Berlin where some of the American work on uranium is now being repeated. ​The ultimate toll of the atomic age is still to be determined. To say atomic warfare played a role in the near destruction of humanity during the Cold War is an understatement. Military strategists, scientists, and great thinkers of the atomic age actually adopted a unit of measure called a megadeath, or one million human deaths, to calculate the costs in lives that would occur during all-out nuclear warfare. As a consequence to the atomic age, people were stripped of their individuality, packed into one million unit groups, and marked for an anonymous and impersonal death. It was with the bombings of Japan with Hiroshima and Nagasaki that we first learned the horror of not only the destructive force of nuclear weapons, but also of humanity’s capacity for unleashing inhumanity. The victims of the bombings, named hibakusha, total over 650,000; 475,000 have their individual names written in books located at the Hiroshima and Nagasaki memorials- 303,195 of them victims of Hiroshima. Sadako Sasaki was a hibakusha that was two years old when the bomb was detonated over her home in Hiroshima. Despite being blown out of her house when the bomb detonated, she was relatively unscathed at the time. Nine years later, she developed swellings on her neck and behind her ears, and by 1955 growths began to accumulate on her legs- her mother referred to these as symptoms of ‘atom bomb disease.’ Young Sadako was diagnosed with acute malignant lymph gland leukemia and, in February 1955 was given one year to live. After her blood transfusion, she committed herself to folding one thousand origami cranes in hopes that a Japanese legend was true- anyone who folded one thousand paper cranes would be granted one wish. Sadako died from her illness on October 25, 1955 at the age of twelve years old. …in the image of a mushroom cloud that rose into these skies, we are most starkly reminded of humanity’s core contradiction. How the very spark that marks us as a species, our thoughts, our imagination, our language, our toolmaking, our ability to set ourselves apart from nature and bend it to our own will – those very things give us the capacity for unmatched destruction. Science allows us to communicate across the seas and fly above the clouds, to cure disease and understand the cosmos, but those same discoveries can be turned into more effective killing machines. …Mere words cannot give voice to such suffering. But we have a shared responsibility to look directly into the eye of history and ask what we must do differently to curb such suffering again. …the memory of the morning of August 6, 1945 must never fade. That memory allows us to fight complacency. It fuels our moral imagination. It allows us to change. ​So, five years later I return to the question posed by my twenty-four year old self, “Where should we go from here?” Do we still worship the atomic bomb? Are we packing our nuclear weapons up? What are the consequences of humanity’s seemingly uninhibited and insatiable desire not only to innovate, but to dominate as well? With a crumbling nuclear infrastructure and a current presidential race that seems more interested in pejoratives than disarmament or constructive discussions, I’m not sure of humanity’s trajectory. On August 24, 2016, almost 71 years to the day after the bombing of Hiroshima, North Korea’s military warned it will turn Seoul and Washington into “a heap of ash through a Korean-style preemptive nuclear strike” if provoked. On September 9, 2016, three days after my visit to Hiroshima and only two weeks after warning of a preemptive attack, North Korea tested it's largest nuclear warhead to date, with a payload equivalent to 10 kilotons of TNT. The same day, President Obama responded by calling for deployment of Terminal High Altitude Arial Defense (THAAD). On October 15, 2016, North Korea fired an intermediate ballistic missile near Kusong which exploded immediately after launch. As of October 17, 2016, The White House has yet to release an official response. On December 20, 2016, afake news story falsely stated that the former Israeli defence minister, Moshe Yaalon threatened to attack Pakistan with nuclear weapons if they intervened in Syria to destroy Daesh. On December 22, 2016, President Elect Donald Trump Tweeted, "The United States must greatly strengthen and expand its nuclear capability until such time as the world comes to its senses regarding nukes"
On December 23, 2016, in response to a fake news story about an Israeli nuclear attack, Pakistani Federal Minitester of Water, Power, and Defense, Khawaja M. Asif, Tweeted: "Israeli def min threatens nuclear retaliation presuming pak role in Syria against Daesh.Israel forgets Pakistan is a Nuclear state too AH"
At night, the gardens are quiet and peaceful.